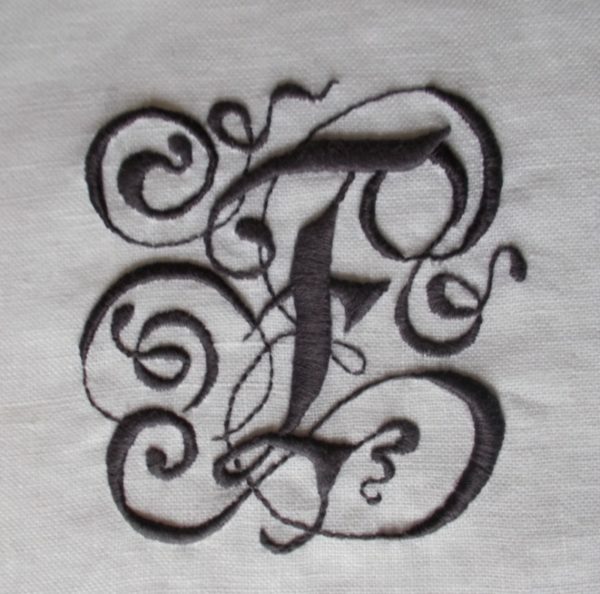 Embroidering all the letters of the alphabet is proving to be rather liberating. 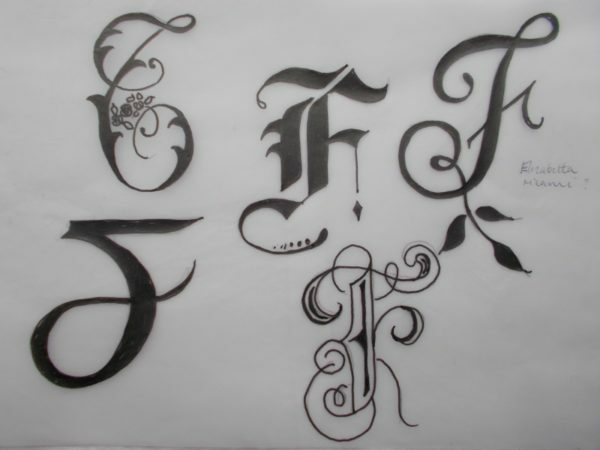 Once one letter is finished I lie awake in bed before sleeping planning the next letter – and often the next 2, 3 or 4. 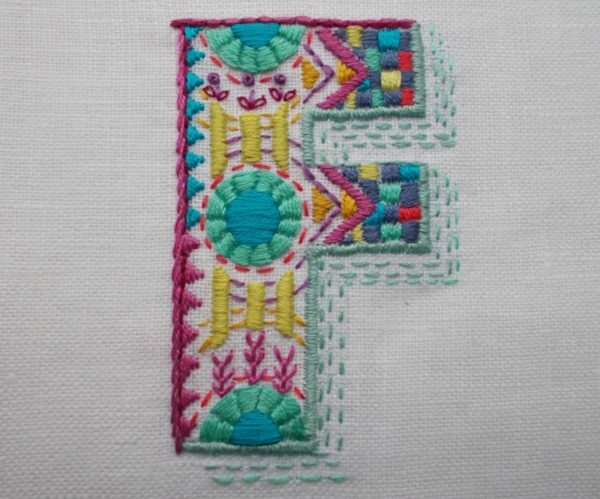 For a while now I’ve been looking forward to doing a chunky, brightly coloured F as a contrast to the very traditional one I did not long ago ( in an inky aubergine, lassoed around by lots of calligraphic loops – see below). I started out channelling Charleston Farmhouse with a design of bold circles and checkerboards but seem to have ended up more Eduardo Paolozzi – two styles I’d never really associated together before, but there you go! Work on Ipsden altar frontal has been going well. I just need one more embroidered flower which I shall work on this week. The patchwork is now the right size to fit the table in question and is ready to be ‘tried on’ so we can decide various things – should just reach the floor or spread over it a bit, should have a plain border all round or be patchworked right up to a bound edge? Strangely my need to be in Ipsden has coincided with Ipsden needing us – well needing the vicar that is. A much loved parishioner has died and his funeral coincides with the current parish priest’s well-deserved holiday. As my husband is due for his second cataract removal this week, he won’t be ready to drive (and I’m not a confident driver if I know I’m sitting beside someone who can’t see properly – pathetic, I know!). None of these complexities phases Ipsden inhabitants one little bit. People have offered to fetch us (and I hope return us) and put us up for the night. It will be wonderful to return to the village, the church and old friends, albeit in the saddest of circumstances. A final fitting for the altar frontal will be a time to pause and remember the joys and sorrows of being part of a community we came to love and respect. I’m currently enjoying reading one of those books which has been a surprise summer hit – not bad for something first published in 1954. 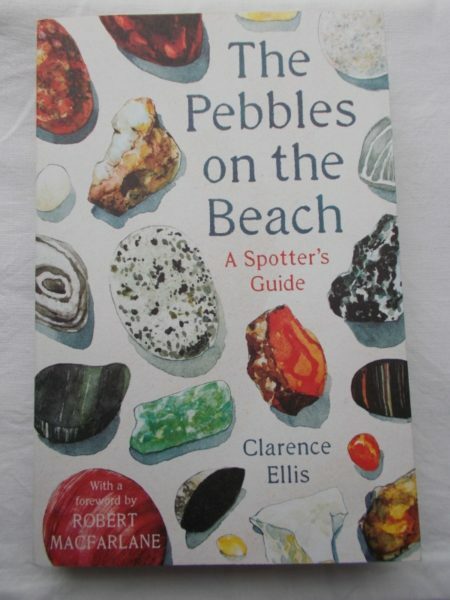 The Pebbles on the Beach: A Spotter’s Guide by Clarence Ellis is a very user friendly book and great for answering all of those niggly questions you wouldn’t address to a textbook of geology. When I worked in Oxford I used often to buy necklaces of semi precious stones from a couple of Chinese girls who had a stall on Cornmarket, so, for people like me, Clarence’s chapter on semi-precious stone is of especial interest. Nearly all semi-precious stones (or demi-semi-precious as Clarence calls them, which I think covers all of what I have) consist of silica, in the form of quartz. White, opaque quartz is abundant, while the completely transparent quartz, or rock crystal, is much rarer. If you have beads of rose quartz, they are the former more common sort, while amethyst beads, light purple to violet (probably due to the presence of manganese) are of the transparent and less common variety. I’m sure some of my beads are dyed or heat treated and now I know to be particularly careful of carnelian whose redness can be artificially created by either by staining or heat treating the stone with a solution of the salts of iron. I shall share my Pebbles on the Beach with my grandson which I hope will make him a bit more discerning about the stones he picks up. Along with parish councils in Cornwall, I do worry about millions of people leaving beaches with pockets full of stones. Armed with the knowledge in this little book we might more happily each just take two or three we find especially interesting. 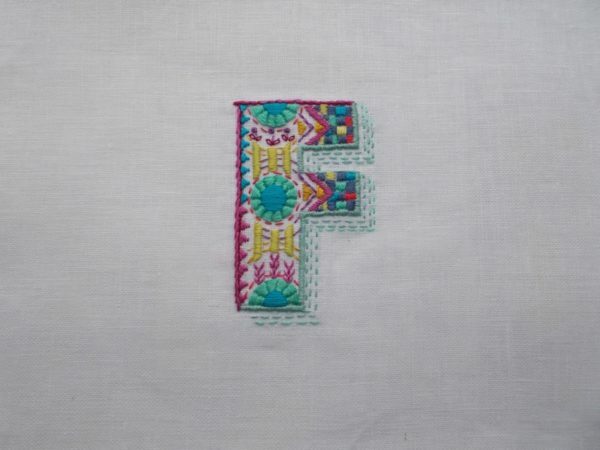 Thank you, Rachel – I’m glad you like the Fs. The Pebbles on the Beach is a nice gentle read, quietly informative and with a confident authorial voice reminiscent of old fashioned school masters. You inspired me to order a copy of Pebbles on the Beach – sounds like just the thing for an upcoming trip to Maine. I’m tremendously enjoying your archives, even if my embroidery isn’t improving as a result. The Pebbles on the Beach is just the thing for having in your car or pocket for such a visit – have a lovely time. Thank you for letting saying such nice things about my blog, Ceci.